Moving to a new town to start university can be both an exciting and daunting experience. Presented with new opportunities to learn, grow and meet people from a diverse range of backgrounds, expectations can be high that our university years will be the time of our lives. But navigating the opportunities and demands of university can be a tricky business. Whilst many appear to be living their “best lives” here in Cambridge, it doesn’t take much digging to uncover that student life isn’t always that rosey. The stresses of deadlines and exams can take their toll. It can become all too easy to sacrifice sleep, self-care and even our mental and emotional wellbeing for the sake of good grades. Finding a sustainable balance between the work you need to do, and the rest, relaxation and enjoyment that your body and mind need in order to function well, is key. This is where yoga comes in. In my experience, yoga can be a great teacher - and not just of postures with strange Sanskrit names. Coming to Cambridge to study psychology and education, I found it almost impossible to juggle all my coursework alongside the many university societies I had joined through a tendency to say “yes” to everything. In the end, this lead to a relapse in problems with eating that I had experienced since my teens. Without looking after my health, it didn’t matter how high my marks were - it wasn’t going to be sustainable. I’d always wanted to try yoga, and had heard of CAMYOGA. I’d planned to give it a try, but that plan sat with me for around 6 months - there was always something more important to do than take time out for myself. But eventually, I made it to an open day. Setting foot through the door and stepping onto the mat marked the start of one of the most valuable learning processes I have ever undertaken. Whilst I was studying the mind and behaviour in the classroom, I was learning all kinds of new lessons about myself in the yoga studio. These have helped me to find balance, feel more comfortable in my own body and move with more ease in my day to day life - not just physically, but mentally and emotionally too. Letting go of an “all-or-nothing” mindset is key to finding balance. The yoga sutras talk about a balance between “effort and ease” when practicing yoga postures. But this is an invaluable lesson for life too. Trying hard and doing your best can be hugely rewarding, but it is never an all-or-nothing game. If we don’t take rest, we can get exhausted and burn out. If we think that anything less than perfection is a failure, we can get paralysed, judge ourselves harshly when we don’t meet expectations, and even stop trying. Yoga teaches acceptance, and working with where you are without the need to be perfect. This can be a great antidote to a perfectionist culture where our performance matters. In yoga, there is no performance, nor any competition - even with yourself. Self-care has to come first. Self-conduct has a prominent position in the philosophical roots of yoga. The founders of yoga saw our personal code of conduct as intimately related to how we treat others, with principles such as non-harming applying equally to ourselves and those we encounter. The physical practice of yoga is never about getting into a posture whatever the costs - risking injury and exhaustion just to get the perfect handstand or split. The same applies to university life - getting good grades should never come at the cost of your health. Carving out a space where you can step out of the demands of study won’t cost you marks - it will give the body and mind a chance to rest, improving your focus when you need it. Self-care isn’t just an act of generosity to yourself, either. Looking after yourself gives you more resources to contribute to your friendships and share in the enjoyable parts of being at university too. Mindfulness matters. Being as attentive as possible to the present moment, without judgement or wishing things were different, is central to yoga. When on the mat, we try to notice when our minds rehash the day we had before coming to the studio - or when thoughts rush onto whatever we have to do after class finishes. When the mind is so active, sticking with our movement and breath can be so difficult. The same is true in other areas of life. For example, when working on an essay or project for university, it helps to be able to focus on the here and now, rather than mentally rushing ahead to all the other things we need to do. Letting go of the things you can’t control - whether that’s the way your hips are shaped or the grades you were unhappy with - helps. Many of us only go to uni for a limited amount of time. Learning to appreciate the present moment can help us to fully notice that experience whilst it is here. 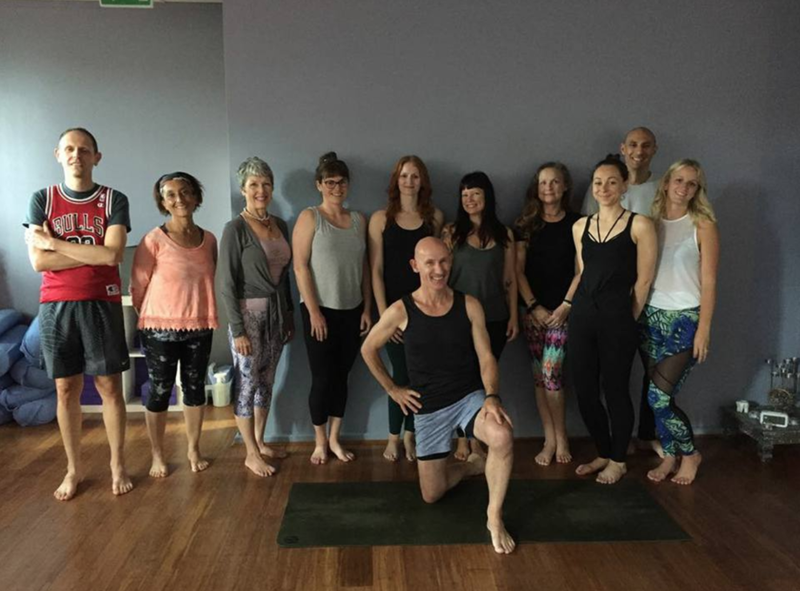 Whether you are new to yoga, returning to practice, or an experienced yogi moving to Cambridge, coming to classes at Camyoga might just help you as much as it helped me. Finding balance might start with wobbling your way through tree pose. But over time, yoga can also help you find a way to balance university life - with all its challenges and rewards. CAMYOGA actually began a long time before the first studio was opened in 2010. It was back in October 2003 that founder Louise began teaching Ashtanga yoga in Grantchester Village Hall and CAMYOGA was born. Actually in the beginning we were called ‘Ashtanga Yoga Cambridge’ but the website was camyoga.co.uk and everyone just started to call us CAMYOGA. 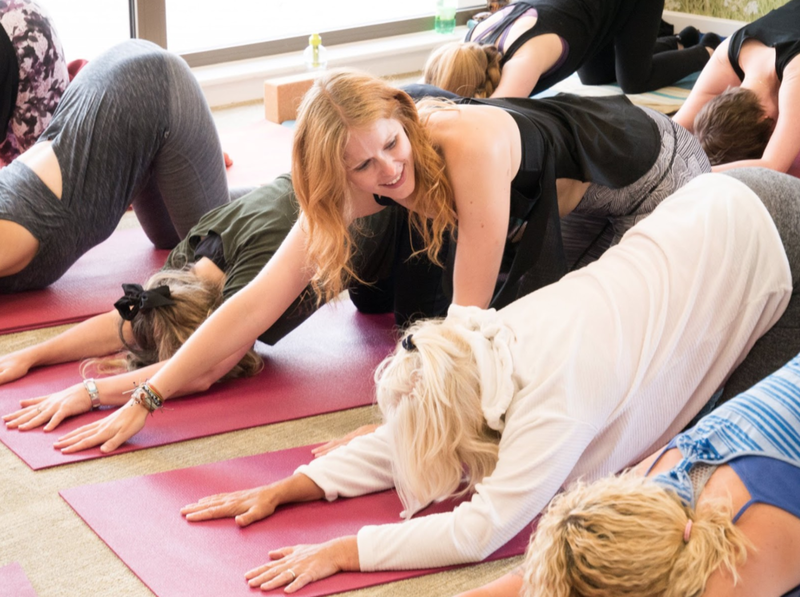 It was Louise’s love of Ashtanga that was the cornerstone of CAMYOGA and the mission was, and still is, to bring together likeminded people to share in the practice and teachings of yoga. Shortly after founding her first classes under the CAMYOGA banner, Louise became pregnant for the first time with Daisy, pictured on the left. When she took maternity leave she got cover for her classes, and when she returned rather than take the classes back, she left the teacher in place and just started new classes. Local Teacher Howard Daly was a big part of these early days covering most of Louise’s classes during maternity and beyond. In this way CAMYOGA grew. The same thing happened when in 2006 she fell pregnant again with Ilia, on the right, and by the time she returned from maternity the second time, more teachers were on board and Louise started to concentrate on growing the yoga business, something she could do from home with a young family. CAMYOGA grew organically for the next few years, and it became increasingly obvious to Louise that it needed to find a permanent home. We had added workshops, retreats and from 2007 a teacher training programme to a busy class schedule. After many near ‘misses’ we managed to secure Central studios in 2010. By this time we had 16 classes a week running and had been piloting a membership system where people could pay a subscription and drop in to any class they wanted. So when we opened the doors in October 2010, it was an easy transition. But even so, we were absolutely BOWLED OVER by the response from the Cambridge community. The studios were busy from the outset and became a real hub for yoga in Cambridge. Students from the early days will remember Louise’s babies on the mat at her baby yoga classes, some may remember her teaching Ashtanga at 8 1/2 months pregnant! Or her pregnancy and active birth sessions based around her own experiences of yoga through pregnancy, birth and recovery. Some of you might remember her trying to get her drop backs back after giving birth! By the time the studios opened, Louise’s husband Jim was also working on the business. Their girls were 6 and 4 at the time, and as the girls grew, CAMYOGA grew and the family/yoga/business story was and still is completely intertwined. The family now work from home, and more recent students may not even know any of this story. But the background and story is embedded in the buildings, and with our staff and teachers many of whom have been with us from the start. We still have students from those very early days before we opened a studio, and it is always a great pleasure when people return from the old days to reminisce. But all students old and new are the life and soul of CAMYOGA. We welcome each and every one of you to share in your love and practice of yoga with us. Now and for many more years to come. Thank you all so much for your amazing support! I graduated from CAMYOGA in April this year, 2018. It took me a long time to decide to take the plunge into doing the training, but it was the best decision for both personal and professional reasons. I am a personal trainer, nutritional therapist and pilates instructor. I have worked in the fitness industry for 12 years and had always thought the training as a yoga teacher would enrich what I already did - so in January this year I decided to go for it. My procrastination about doing the yoga teacher training had nothing to do with a professional choice, because in the way it made perfect sense. My choice was a personal conundrum about whether I wanted to give up something that was very personal to me in order to share it with everyone else… very un-yogi I know, but it was a big decision for me, and it was the BEST decision I have ever made. I started practicing yoga when I was about 17 and unusually for most it started with personal practice at home on my mat while I was at Uni. It was a moment of peace and reflection for me in a world that was getting increasingly unsteady (again for personal reasons) and yoga became my tool to help me press pause. I would lock my bedroom door, get on my mat and either follow a DVD or try to string together some asana sequence which may or may not result in some wacky contortion that was worlds away from any classical posture, but it worked for me. I was hooked. Yoga became something which I never gave up. As other fads came and went, yoga was my constant. And then, as it started to grow in popularity I grappled with whether I was ready to make a profession out of something that was so personal to me. This decision went back and forth, but in the end I concluded that my practice would always be my practice and we all know that the world, now more than ever, NEEDS MORE YOGA!! So that was it. I signed up and never looked back. The course was amazing. I was lucky enough to be with the most incredible, diverse and enthusiastic people, but I honestly believe that you could not walk into a room with a group of people who are all there for the common interest of studying and developing their understanding of something as wonderful as yoga and be disappointed with the eclectic mix you would be faced with. The course did everything I wanted it to do. I gained so much knowledge and understanding of areas of yoga I was less familiar with. I was given wonderful insight into the rich history and philosophy of the practice. The teachers were all fantastic and I left feeling confident in teaching others and with friends for life. I am not one of those people who has dived head first into teaching my own classes. My life at the moment is rebuilding my own health and wellness business slowly as a personal trainer and nutritional therapist while being mummy to two small children, but doing the course and having our morning with Louise discussing ‘the business of yoga’ has helped me an enormous amount with planning the next steps of how to incorporate my business arms together and I am so excited for the future and the doors this course has opened up, both in my mind and for my career. I hope to take some cover classes for CAMYOGA very soon and cannot wait to really get my teeth into launching my own classes next year when my girls are both at preschool. If you are in any doubt as to whether to take this course or you feel less than qualified to do so trust me when I say if you want to do it then apply!!! In my group we were all there for different reasons and it really doesn’t matter what your motivation is. It is an experience for life and one that I am very grateful I was able to do.